Viruses may be stealthy invaders, but a study at the Weizmann Institute of Science reveals a new, chatty side of some: for the first time, viruses have been found communicating with one another. This communication — short “posts” left for kin and descendants — helps the viruses reading them to decide how to proceed with the process of infection. The research was reported in Nature. Many viruses face a choice after they have infected their hosts: to replicate quickly, killing the cell in the process, or to become dormant and lie in wait. HIV, herpes, and a number of other human viruses behave this way and, in fact, even the viruses that attack bacteria — phages — face similar decisions when invading a cell. What causes a virus to choose dormancy over immediate gratification? 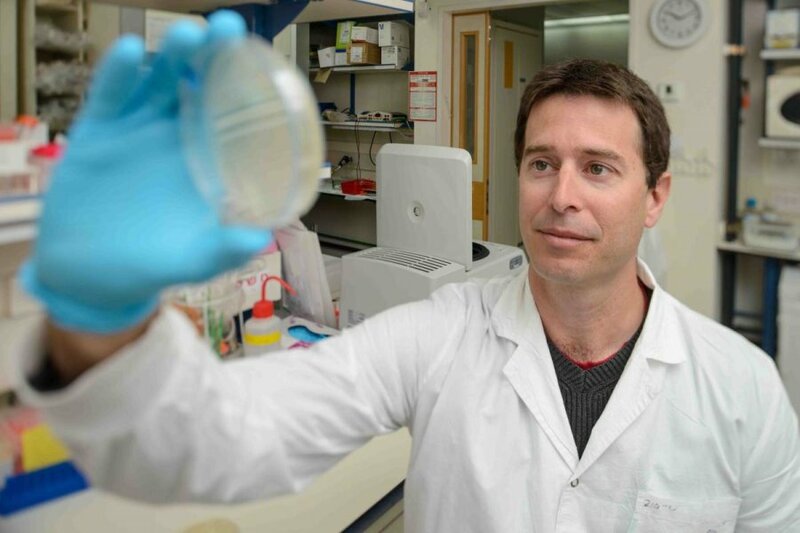 Prof. Rotem Sorek and his group in the Weizmann Institute’s Department of Molecular Genetics have now discovered that, during infection, viruses secrete small molecules into their environment that other viruses can pick up and “read.” In this way, they can actually coordinate their attack, turning simple messages into a fairly sophisticated strategy. Prof. Sorek says that he and his group discovered the communications between phages almost by accident. “We were looking for communication between bacteria infected by phages, but we realized that the small molecules we were finding had been sent by the phages themselves,” he says. “At the beginning of infection, it makes sense for the viruses to go the fast-replication, kill-the-host route,” explains Prof. Sorek, “but if they are too gung-ho, there won’t be any hosts left for future generations of viruses to infect. At some point, the viruses need to switch strategies and become dormant. The molecule we discovered enables each generation of viruses to communicate with successive generations by adding to concentrations of the arbitrium molecule. Each virus can then ‘count’ how many previous viruses have succeeded in infecting host cells and thus decide which strategy is best at any point in time.” The team found that the peptide binds a particular viral protein, which they identified as the genetic inhibitor of the dormancy life cycle. This binding inactivates the inhibitor, shifting the balance into choosing dormancy. Once they had identified this communication molecule in one phage, the researchers were able to find similar molecules in dozens of related phages — each phage encoding a slightly different communication molecule. “We deciphered a phage-specific communication code. It is as if each phage species broadcasts on a specific molecular ‘frequency’ that can be ‘read’ by phages of its own kind, but not by other phages,” says Prof. Sorek. He points out that the communication-based dormancy strategy he and his group discovered was found in phages, but it may have broader implications. “We don’t really know how viruses that infect the human body decide to go dormant. It is possible that a similar strategy to that of the phages could be used by viruses that infect us.” If the viruses that infect humans are found to communicate with one another in a similar manner, we might learn to intercept these messages and use them to our advantage. Журнали American Society for Microbiology – FREE ACCESS NOW!